Change the world one pair of pants at a time, buying them from a democratic welfare state like the UK. It's possible to buy all the parts, including raw microfibre, made in the UK, but there isn't a cheap range of welfare state pants in the shops. This site might help. It's easier to buy pants from countries that are cheaper for lack of a welfare state, but that doesn't reduce poverty. The aim by Nonleather Distribution Ltd is to write a site saying that social insurance reduces poverty. If you googled the company in the mid 20-teens, the impression was of a lot of very employable people - too many - trying to help sell stuff rather than make it or post it. A lot of them could have earned more money doing other things; they were volunteering or on "paid internship" or expenses or mediocre pay. Some like the accounant, Jay Dias, look as though they put a lot of money into the company rather than taking it out as did a private funder in north america. There are odd links here to ex Pants contractors or volunteers or interns, just because it seems rude not to give them a free link, but they might prefer not. The free link is just to promote whatever they are doing now, and I can alter it or remove it as they like. As for the people who funded the jobs, that's a bit different because they might fund something similar with taxpayers' money or corporate donations in future, but I am happy to correct or correspond or add interesting bits to the links. There's no loss to anyone from passing-off. More the other way-around; there is a loss to this web site by being associated with Guardian and Ethical Consumer articles, a County Court judgment, actions by trading standards officers, and mis-use of UK taxpayers' money via Social Enterprise UK and Department for International Development and public PR offices, and mis-use of corporate sponsorship and charitable grants. 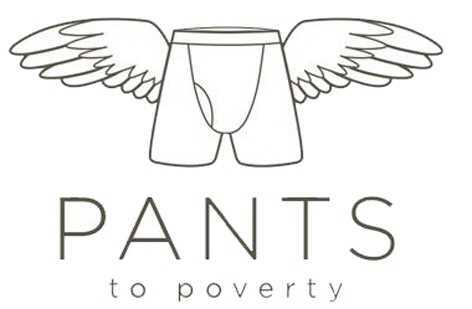 It follows that the name "pants to poverty" is only any use to contrast with something different, or describe the past. There's no intention to discourage the cotton farmers in India who live in clans and do without pesticide - https://ethicalshop.org/suppliers/chetna-organics/ stocks some of their stuff. If there is anyone in the UK willing to spin and knit the stuff, better still. the words are no longer registered, and the logo is registered by a wound-up company which comes to the same thing. About the rudest thing you can do to someone with a web site is to contact their web host and say that it is so dodgy that it should be taken-down to avoid the cost of defending. If you do it to a public information site, that's another bad thing. If you do it on public money, for example because you work for SOAS who were set-up with donations for the public good, who are awarded research funding at taxpayer expense that non-universities would not get, and who are fed customers on taxpayer-funded student grants like Chevening Sholorships, that is another reason to be ashamed. If you are ashamed, obviously you will not state who you are or why your are doing it or any emotive relationship with people who criticise your use of their money. "Due to the heavy abuses conducted on our free hosting we have enabled automatic content filtering for all free accounts. Your page contains these forbidden words: Santander and thus our automatic system is making the redirect and is blocking your website. Please make sure you remove them to fix the error. Unfortunately we cannot disclose the full list of forbidden words due to security reasons. Thank you for your understanding." "Due to the heavy abuses conducted on our free hosting we have enabled automatic content filtering for all free accounts. Your page contains these forbidden words: .ac.uk/ (4 times) and thus our automatic system is making the redirect and is blocking your website." "Hi there, Thank you for contacting. It appears your website was incorrectly detected as abuse by our anti fraud systems. We have reactivated your account, apologies for the inconvenience. You may continue to use your free hosting account now. Best regards"
When a web site is taken down three times by two different web hosts, it's tempting to think that they've had cease-&-desist emails, more or less automated, from someone with something to be ashamed of, spending other peoples' money on lawyers. For example the higher education college, SOAS, runs an internship scheme for ex-students, sponsored by Santander to do whatever a sponsor hopes an internship would do. Here is a guess. Provide brief work experience above the minimum wage for people who have been out of the job market because of study or for some reason need help getting into it. Typically ten weeks to a recent graduate of a first degree after leaving school, aged 20-odd. SOAS' internship scheme is recorded as paying for internship by someone with a second degree and plenty of previous work experience to work at Pants to Poverty, where her CV says she worked a long time on developing transparancy in the accounts of organisations like that, although you can't tell whether only 10 weeks was sponsored by Santander: there is no attempt at transparency so odd facts crop-up and look odd and suggestive without detailed figures available. She's quoted as a "natural capital valuation expert", it says. for UK students who see a scheme to crowd-out UK manufacturing with its higher costs that are partly to fund a welfare state with unfair competition. For example Josiery which closed for lack of interest, while the similar company Armstrong Mills in India got free publicity funded by UK taxpayers. "The internships that we arrange centrally at SOAS and/or sponsor are either microplacements, which are 2 week placements paid at London Living Wage, or longer-term Santander Internship funded ones and we haven't liaised with ethical fashion brands in that postcode for these. Please note that our systems only allow us to go back as far as the Academic Year 2014-15." "What safeguards prevent money intended to promote export of design skills being used in fact to promote out-sourcing of production from the UK and democratic countries, to autocratic countries and China". These organisations are "known to each other" ; "share a world view". One report states: "The £5m award was allocated by Trade and Industry Secretary Alistair Darling through the Higher Education Innovation Fund." Another minister who shared the world view appeared from press releases to be Mr Purnell, now a director of the BBC which is to be allocated office space in Stratford as part of a similar deal, who made a speech at a University of the Arts building in support. This is a man who's first job after college was to be a researcher for Tony Blair, so he does not have first-hand experience of trouble getting a job, even after college. Pantstopoverty.com discouraged (via a page on the Ethical Fashion Forum web site and by crowding-out of media coverage) buying goods from countries like the UK with social insurance systems. It promoted the buying of goods from badly-run countries as a way of reducing poverty, and extracted tents of thousands of pounds from UK taxpayers to do so and to put UK taxpayers out of work. It did not advocate pressure on badly-run countries to change, such as tariff systems. The names of highly-paid ministers, civil servants, and even academics who authorised this are still not known, nor are there any signs of apology or second thoughts. There are scraps of information like a department at University of the Arts' London College of Fashion being called "centre for sustainable fashion" and helping a party-line group called "all party group for ethics and sustainability in fashion" in the house of lords. There are various inter-departmental schemes in the late 2000s that are public such as Delphe to promote a certain kind of development studies course at higher education institutions round the world. There are corporate sponsors who might be embrarassed too, after doling-out money to put their customers out of work. There are lots of people who might feel the need to send a cease and desist notice so it's good that hardly any of them have done so. Just get in touch with Nonleather Distribution via brittaniabuckle at yahoo co uk and sort something out. And if you are wondering why the rather strange email address, there was a belt factory that started in Britannia House or Britannia Street - just a short walk away from the Pants to Poverty office in North West London. It had to close in the late 2000s, like a lot of clothing and footwear companies about that time, leaving the email spare for odd things like this. Also, if you can help complete the story with some missing info, just get in touch. I don't know if the phrases "santander" and "ac.uk" are used to divert attention. Maybe they are used tactically. Or the simplest option could be true: someone from the soas.ac.uk working with Santander to fund internships wants to make this look better. Managing consultant for Pi Foundation, a registered foundation supporting the work of Pants to Poverty. The model was shortlisted for the Global Leaders in Sustainable Apparel Award in Copenhagen in April 2014. This web site does not recieve funding from the Higher Education Funding Council, and will not recieve office space as part of the Queen Elizabeth Park Development on the Olympics site in Stratford.